Destiny 2 – Digital Deluxe – PS4 [Digital Code] Pre-orders for LIVE, In Stock and Includes Early BETA Access! Pre-order Destiny 2 – Digital Deluxe – PS4 [Digital Code] and be one of the first to play the game with Early Beta Access.Get the ultimate Destiny 2 experience with the Digital Deluxe Edition. Includes a copy of Destiny 2, premium digital content, and the Expansion Pass to continue your Guardian’s legend. 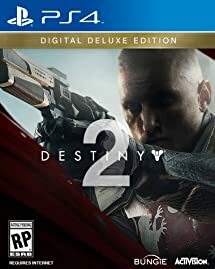 Destiny 2 – Digital Deluxe – PS4 [Digital Code] has a scheduled release date of September 6, 2017. Previous PostPrevious Amazon Digital Blowout Video Game Deals (Up to 90% Off)! Next PostNext Amazon Digital Video Game Blowout Deals: May Update (Up to 90% Off)!